Enhanced, new platform with exciting new content features and tools. 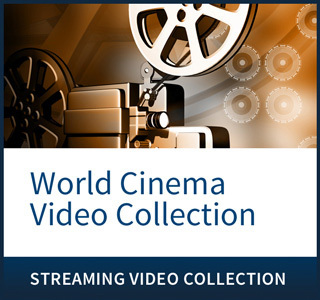 Save yourself time—and your institution money—with the Films On Demand streaming video subscription collections. 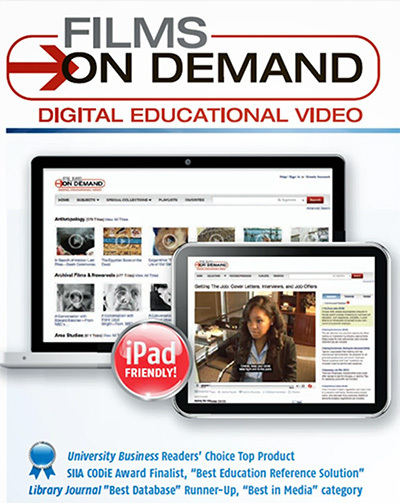 With unlimited access to almost 20,000 videos, these complete, multi-subject video solutions are an exceptional value and offer convenient one-stop shopping for your institution. Each full-length video has been divided into annotated clips, making it easy to find specific pieces of content quickly. All videos provide a wide range of bit rates (200k–1.5mb) to ensure high quality viewing in variable bandwidth environments. Even at full-screen, the video quality is outstanding. Your subscription is kept fresh and continues to grow with approximately 1,000 new titles added each year, making Films On Demand an incredible value for any institution. Outstanding content from Films Media Group and from more than 700 producers are included in these comprehensive subscriptions—more than you’ll find anywhere else. 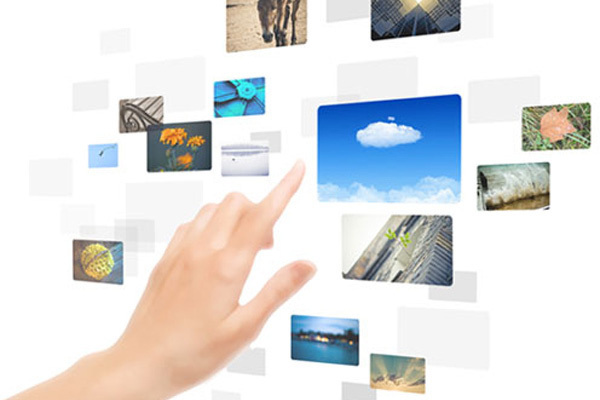 And now you can activate over 50 web channels from vetted sources, tripling the content available. Upgraded Server Infrastructure - ensures improved overall performance and faster page load speeds. Redesigned and Responsive Interface - provides a seamless user experience on any type of device. Customizable Platform - includes home page features, account preferences, and institution branding. Custom Content Upload Option - allows administrators to add licensed of locally produced content to Films on Demand. Freedom from inventory hassles and damaged DVDs. Google translates for transcripts is a very helpful feature for students whose first language is other than English. All streaming videos have captioning and cross-searchable, interactive transcripts, ensuring that the widest audience possible has access to the full range of video content in the subscription. The ability to search not just within the interactive transcripts, but across the full transcripts of all the titles in your account, also provides extremely targeted, specific results. Your subscription collections offer convenient one-stop shopping—with multi subject collections geared colleges and universities, as well as subject-specific collections for specialized departments. 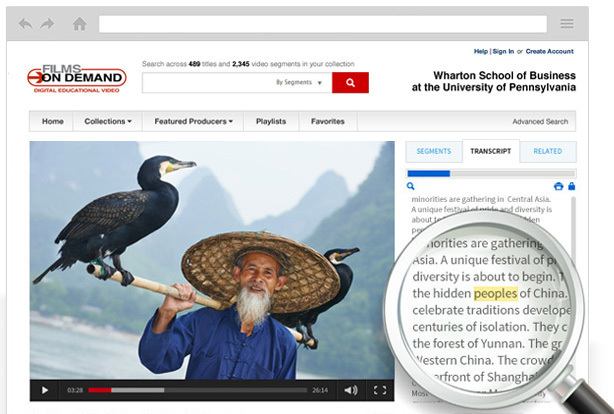 Thousands of predefined video clips make it easy to find specific pieces of content quickly. Users can also create their own unique custom segments, which can then be added to a playlist or embedded into a secure website or Learning Management System. This collection is designed not only to help nursing students excel in their studies and pass licensure exams, but also to prepare them for long-term job success in an increasingly complex health care system. It features titles from trusted producers such as Cengage Learning/Concept Media, NEVCO, Wolters Kluwer Health, Institute for Professional Care Education/Medifecta, and others. 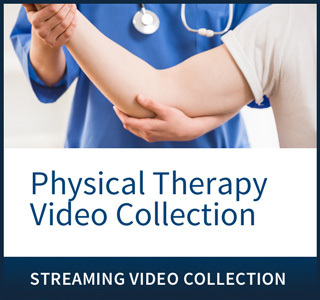 This collection brings together 160 videos that will help physical therapy students learn and practice crucial techniques in ways textbooks alone cannot. These short instructional clips from trusted producer Wolters Kluwer Health cover a wide range of physical therapy interventions and examinations, from stretching techniques to wrapping a shin splint. 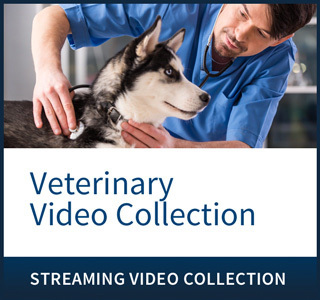 This collection brings a much needed visual component to veterinary students’ lessons, facilitating learning in often subtle ways textbooks alone cannot. Its more than 240 titles will help students gain a strong foundation in animal anatomy, physiology, and behavior while learning basic veterinary procedures and an understanding of the workplace. With feature films from the most renowned directors across the globe, this unique collection includes the best of the silent era, groundbreaking international directors, American and European masterpieces from the mid-20th century, award-winning contemporary films featured by Global Lens, and films from Africa and the African diaspora from ArtMattan Productions. 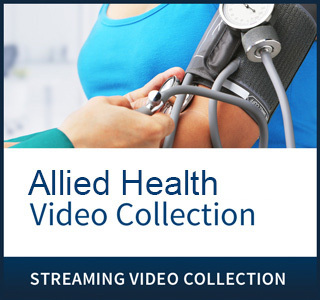 This collection will help prepare future allied health professionals for practice across a diverse range of health care settings, whether they are learning how to draw blood, administer medications, or help deliver a baby. The videos include titles from trusted producers such as Elsevier, NEVCO, Center for Phlebotomy Education, InJoy Health Education, Educational Media Distributors, and others.